Printed from http://www.bodytalksystem.com//learn/news/article.cfm?id=833 on Apr 22, 2019. 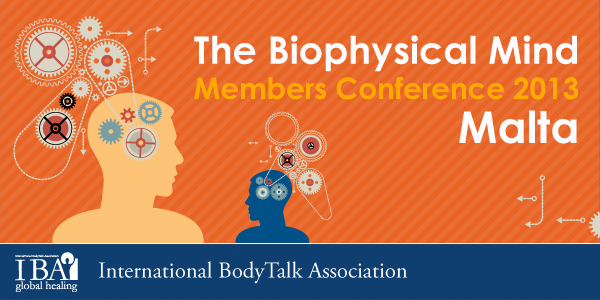 Understanding the Biophysical Mind – Deepen your comprehension of the relationships between BodyTalk, the new Physics and the dynamics of Quantum Healing. Very subtle energetic interactions are becoming more and more important in explaining alternative medicine and energy medicine. James takes us through the complexities of these energetic interactions, introducing us to ideas and interpretations from quantum physics that explain the value of the practitioner's role in facilitating change processes in the client. It has been generally accepted that the blueprint for the human body resides with the DNA. However, this presentation provides an enhanced view of how information is contained and utilised within the Universe, and how our consciousness interacts with this information. The morphic field acts as a repository for data that is interpreted and absorbed by every part of the body. In most cases when two people are talking it is not a dialogue, but a two-way monologue. This is one of the fundamental causes of conflict on this planet. Meaningful communication is only possible when the person communicating is able to recognise and translate their message into concepts and values accepted by the other person. Our senses provide the initial input that form our individual perspectives on our world, and hence contribute to the development of personal belief systems and operating assumptions. This gives rise to mono-logical minds and mono-paradigmatical minds. The goal is to evolve beyond this stage to and omni-centric perspective, which is the ability to view the world from another's perspective. This can lead to a tremendous mental and spiritual freedom. Once you have achieved this freedom, when you are with someone you can enter into their paradigm and understand what he or she is saying or thinking in terms of his or her own paradigm. This is real understanding. Familiarise yourself with the new physics. As the language that is used to explain and illustrate the processes that occur, it is important to have a clear understanding of the terminology, the concepts, the history and the science involved. Quantum processes are involved in the entire cycle of energy from the sun to the green plant to animals and to our muscles and our activities. Quantum processes are involved at every step. What are psychoenergetic systems? They are defined as the study of interactions between consciousness, energy and matter. This means that all parts and all processes of these interactions can be reached by a consciousness-based therapy such as The BodyTalk System. James poses the question "To what extent does consciousness involve processes taking place in the brain, and to what extent does consciousness involve processes taking place in the environment of the body?". In answer to this, he will present and discuss new ideas about what the unconscious mind really is. This expanded view of consciousness and the unconscious explains how virtually all processes taking place in the body are involved. The presentation explains how you are able to connect with any particular process taking place within your client. "Water, water everywhere..." – it's more important than you think! The latest research discussed here will highlight new key roles of water. It has emerging importance as a structural mechanism for the molecules of the body, and also as the interface between every part of the body and the quantum information field. We use assumptions to simplify the complex, drawing from previous experiences to construct a working model that enables us to anticipate outcomes. As a tool, assumptions are meant to be tentative, and replaced over time with more definitive or refined versions. Find out what happens when that initial assumption is retained and gradually comes to be taken as fact. This presentation includes some extraordinary new discoveries that fit together to produce a valuable and consistent picture that can explain some of the phenomena taking place in BodyTalk. John Veltheim and James L. Oschman Ph.D will be presenting The Biophysical Mind at the conference in Malta October Register for live or LiveStream Now!